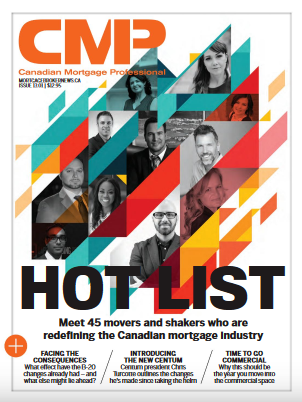 Canadian Mortgage Professional (CMP) magazine has published its exclusive Hot List of 2018. intelliMortgage co-founder Rob McLister was among 45 of the mortgage industry’s top players on that list. “…despite a challenging environment, these 45 professionals went above and beyond for both clients and peers, setting the bar for what makes a great mortgage broker,” reads the article. Mr. McLister was commended for his 2017 decision to retool intelliMortgage—which he launched with wife Melanie. His makeover heightened iM’s focus on digital marketing and included a complete technological revamp, thus enhancing its DYI mortgage experience for clients. The result was a 20% spike in applications by year-end 2017.